Good morning! I can’t wait to camp again! October, our last camping trip, was forever ago! This wild, winter weather is not helping me to be patient, either! With a 50 degree temperature swing after the cold snap, it seems just like spring! And 40 degrees is almost camping weather, right? 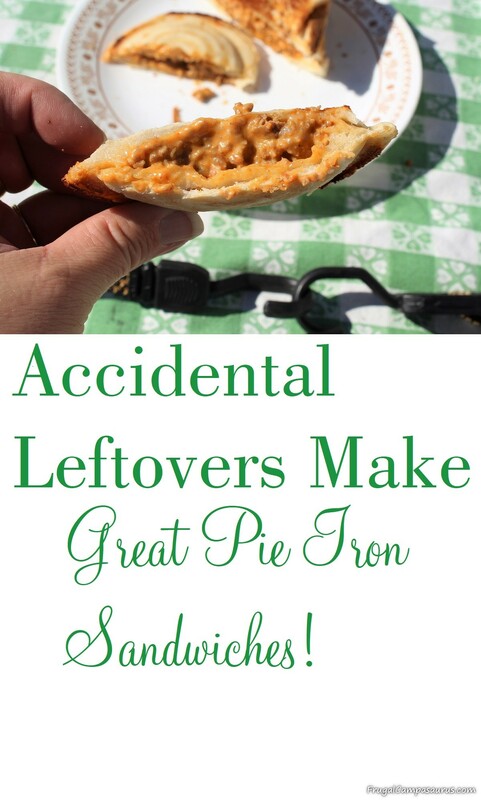 Even though snow and winter are soon coming back, I can still share the Accidental Leftover Pie Iron recipe we enjoyed on our October camping trip. Maybe sharing it will help the camping season get here faster! The Accidental Leftover Pie Iron recipe was totally unplanned and entirely my fault. I did not intend to have a huge bowl of cheesy hamburger dip as leftovers, but at least I could play with the leftovers over the campfire! Occasionally, we have munchies for supper. Nachos, fondue or meat and cheese is not a healthy supper, but it is fun once in a while. 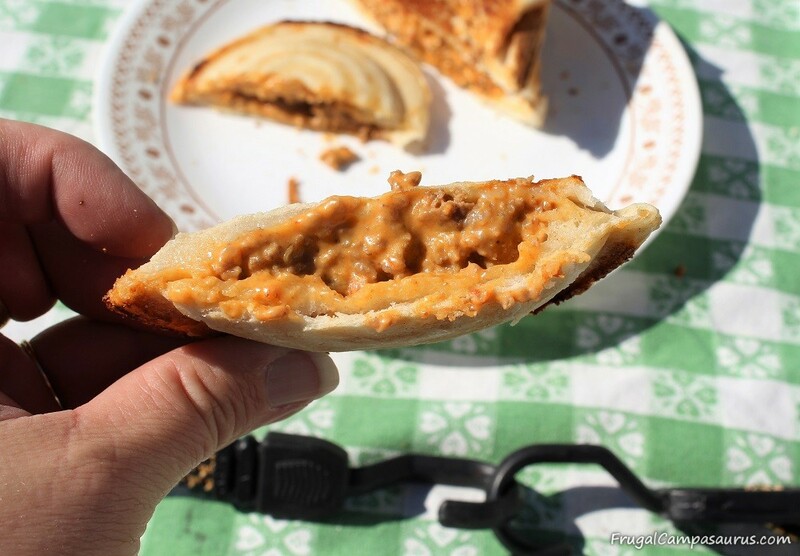 During our last camping trip, I thought cheesy hamburger dip would be a fun, easy supper. We browned hamburger over the fire in the Dutch oven and added salsa and sliced cheese. Soon, it was a warm, gooey, yummy supper. Unfortunately, it was not yummy for all of us and I had made a huge batch of dip. The older 2 were not at the campground for supper, and the youngest one just looked at me when I said ‘Ready’. The youngest does not like gravy, salad dressings, sauces, ketchup(? ), nachos, fondue…… I should have known the youngest would not enjoy our fun, easy, cheesy Friday supper. So, I had a large amount of leftovers. 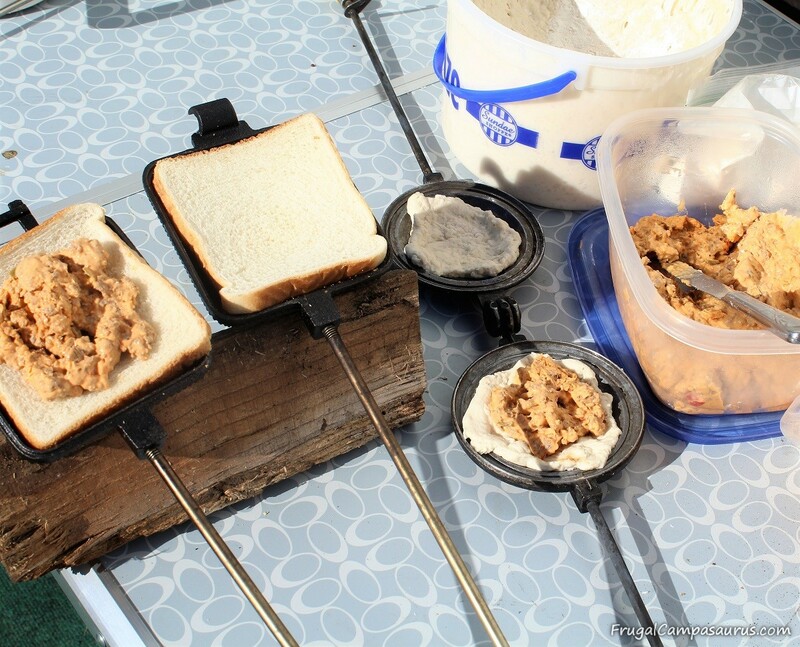 Fortunately, I had Bucket O’Bread in the refrigerator and we had time to experiment over the campfire for Saturday’s lunch. We were pleasantly surprised with the Accidental Leftover Pie Iron lunch. Sooo yummy! 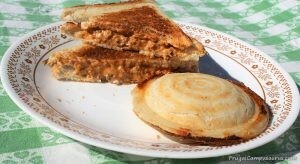 We tried 2 variations of the pie iron sandwiches-1 with sliced bread and 1 with Bucket O’Bread. Both were good, though we preferred the chewier crust of the Bucket O’Bread sandwich with the soft, gooey cheese dip filling. Brown hamburger and drain off grease. Add salsa and cheese slices, stir often as the cheese melts. Sometimes, I add a bit of milk to thin it down. Be very careful if cooking it over the campfire, so the cheese doesn’t scorch. I do move the Dutch oven around a lot, to keep it over a lower heat and to not get my arm scorched when stirring. Serve with chips or crackers, and keep leftovers for Pie Iron sandwiches! Generously butter the bread and place butter side facing out, to prevent sticking to the pie iron. A cheesy yummy lunch! See the frugal tablecloth holder? I oil the pie irons for the Bucket O’Bread sandwich, and then pull and pat 2 walnut size pieces of dough out for the top and bottom crusts. The dough can be very sticky, so I sprinkle the top of the dough with flour before taking it out of the bucket. Place 2-3 Tablespoons of cold, leftover dip on bread or dough. 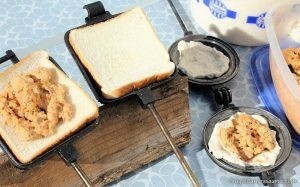 The sandwich should be full, so the bread has good contact with the pie irons and gets golden brown. But not so full it won’t shut easily. The edges of the dough variation need to be pressed and sealed together around the filling,but fully inside the pie iron cooker. I use either my fingers or a fork. If you forget, they will not magically seal together as the dough rises and cooks. They are still delicious, just messier. After closing the pie irons, trim the extra bread from the edges of the pie iron so it doesn’t burn. It is sooo hard to wait for pie iron sandwiches to cool down! Then, cook on both sides over the fire until golden brown and toasty. Cooking time depends on heat of the fire and how hungry or patient you are. Sometimes, I set them over the coals and other times, I will set them right in the flames. Since I often cook in the flames, I prefer cast iron pie irons. They are heavier, but hold up to the heat better than the Teflon pie irons we used to have. Once both sides are golden brown, flip them out of the pie irons onto a plate to cool. Waiting to eat is the hardest part- but the yummy, gooey cheese dip filling will be smoking hot! Well, now the cold and blowing snow are back. I am glad I was able to share the Accidental Leftover Pie Iron sandwiches with you, but it sure makes me miss camping. Hopefully spring will be here soon! Next Post:Frugal Campasaurus Turns 2 Years Old!